The dates of Patrick's life cannot be fixed with certainty, but there is broad agreement that he was active as a missionary in Ireland during the fifth century. Nevertheless, as the most recent biography on Patrick shows, a late fourth-century date for the saint is not impossible. Early medieval tradition credits him with being the first bishop of Armagh and Primate of Ireland, and they regard him as the founder of Christianity in Ireland, converting a society practising a form of Celtic polytheism. He has been generally so regarded ever since, despite evidence of some earlier Christian presence in Ireland. According to the autobiographical Confessio of Patrick, when he was about 16, he was captured by Irish pirates from his home in Britain and taken as a slave to Ireland, looking after animals; he lived there for six years before escaping and returning to his family. After becoming a cleric, he returned to northern and western Ireland. In later life, he served as a bishop, but little is known about the places where he worked. By the seventh century, he had already come to be revered as the patron saint of Ireland. Saint Patrick's Day is observed on 17 March, the supposed date of his death. It is celebrated inside and outside Ireland as a religious and cultural holiday. In the dioceses of Ireland, it is both a solemnity and a holy day of obligation; it is also a celebration of Ireland itself. Two Latin works survive which are generally accepted as having been written by St. Patrick. These are the Declaration (Latin: Confessio) and the Letter to the soldiers of Coroticus (Latin: Epistola), from which come the only generally accepted details of his life. The Declaration is the more biographical of the two. In it, Patrick gives a short account of his life and his mission. Most available details of his life are from subsequent hagiographies and annals, which have considerable value but lack the empiricism scholars depend on today. The only name that Patrick uses for himself in his own writings is Pātricius [paːˈtrɪ.ki.ʊs], which gives Old Irish Pátraic [ˈpaːtraiɡʲ] and Modern Irish Pádraig ([ˈpˠaːd̪ˠɾˠəɟ]); English Patrick; Welsh Padrig; Cornish Petroc. Hagiography records other names he is said to have borne. Tírechán's seventh-century Collectanea gives: "Magonus, that is, famous; Succetus, that is, god of war; Patricius, that is, father of the citizens; Cothirthiacus, because he served four houses of druids." "Magonus" appears in the ninth century Historia Brittonum as Maun, descending from British *Magunos, meaning "servant-lad". "Succetus", which also appears in Muirchú moccu Machtheni's seventh century Life as Sochet, is identified by Mac Neill as "a word of British origin meaning swineherd". Cothirthiacus also appears as Cothraige in the 8th century biographical poem known as Fiacc's Hymn and a variety of other spellings elsewhere, and is taken to represent a Primitive Irish *Qatrikias, although this is disputed. Harvey argues that Cothraige "has the form of a classic Old Irish tribal (and therefore place-) name", noting that Ail Coithrigi is a name for the Rock of Cashel, and the place-names Cothrugu and Catrige are attested in Counties Antrim and Carlow. The dates of Patrick's life are uncertain; there are conflicting traditions regarding the year of his death. His own writings provide no evidence for any dating more precise than the 5th century generally. His Biblical quotations are a mixture of the Old Latin version and the Vulgate, completed in the early 5th century, suggesting he was writing "at the point of transition from Old Latin to Vulgate", although it is possible the Vulgate readings may have been added later, replacing earlier readings. The Letter to Coroticus implies that the Franks were still pagans at the time of writing: their conversion to Christianity is dated to the period 496–508. Irish academic T. F. O'Rahilly proposed the "Two Patricks" theory, which suggests that many of the traditions later attached to Saint Patrick actually concerned the aforementioned Palladius, who Prosper of Aquitaine's Chronicle says was sent by Pope Celestine I as the first bishop to Irish Christians in 431. Palladius was not the only early cleric in Ireland at this time. The Irish-born Saint Ciarán of Saigir lived in the later fourth century (352–402) and was the first bishop of Ossory. Ciaran, along with saints Auxilius, Secundinus and Iserninus, is also associated with early churches in Munster and Leinster. By this reading, Palladius was active in Ireland until the 460s. Prosper associates Palladius' appointment with the visits of Germanus of Auxerre to Britain to suppress Pelagianism and it has been suggested that Palladius and his colleagues were sent to Ireland to ensure that exiled Pelagians did not establish themselves among the Irish Christians. The appointment of Palladius and his fellow-bishops was not obviously a mission to convert the Irish, but more probably intended to minister to existing Christian communities in Ireland. The sites of churches associated with Palladius and his colleagues are close to royal centres of the period: Secundus is remembered by Dunshaughlin, County Meath, close to the Hill of Tara which is associated with the High King of Ireland; Killashee, County Kildare, close to Naas with links with the kings of Leinster, is probably named for Auxilius. This activity was limited to the southern half of Ireland, and there is no evidence for them in Ulster or Connacht. Although the evidence for contacts with Gaul is clear, the borrowings from Latin into Old Irish show that links with Roman Britain were many. Iserninus, who appears to be of the generation of Palladius, is thought to have been a Briton, and is associated with the lands of the Uí Ceinnselaig in Leinster. The Palladian mission should not be contrasted with later "British" missions, but forms a part of them; nor can the work of Palladius be uncritically equated with that of Saint Patrick, as was once traditional. Patrick was born in Roman Britain. His birthplace is not known with any certainty; some traditions place it in England—one identifying it as Glannoventa (modern Ravenglass in Cumbria)—but claims have also been advanced for locations in both present-day Scotland  and Wales. Calpurnius, his father, was a decurion and deacon, his grandfather Potitus was a priest from Bonaven Tabernia, Patrick, however, was not an active believer. According to the Confession of Saint Patrick, at the age of sixteen he was captured by a group of Irish pirates. They took him to Ireland where he was enslaved and held captive for six years. Patrick writes in the Confession that the time he spent in captivity was critical to his spiritual development. He explains that the Lord had mercy on his youth and ignorance, and afforded him the opportunity to be forgiven his sins and convert to Christianity. While in captivity, he worked as a shepherd and strengthened his relationship with God through prayer, eventually leading him to convert to Christianity. The condemnation might have contributed to his decision to return to Ireland. According to Patrick’s most recent biographer, Roy Flechner, the Confessio was written in part as a defence against his detractors, who did not believe that he was taken to Ireland as a slave, despite Patrick’s vigorous insistence that he was. Patrick eventually returned to Ireland, probably settling in the west of the island, where, in later life, he became a bishop and ordained subordinate clerics. The second piece of evidence that comes from Patrick's life is the Letter to Coroticus or Letter to the Soldiers of Coroticus, written after a first remonstrance was received with ridicule and insult. In this, Patrick writes an open letter announcing that he has excommunicated Coroticus because he had taken some of Patrick's converts into slavery while raiding in Ireland. The letter describes the followers of Coroticus as "fellow citizens of the devils" and "associates of the Scots [of Dalriada and later Argyll] and Apostate Picts". Based largely on an eighth-century gloss, Coroticus is taken to be King Ceretic of Alt Clut. Thompson however proposed that based on the evidence it is more likely that Coroticus was a British Roman living in Ireland. It has been suggested that it was the sending of this letter which provoked the trial which Patrick mentions in the Confession. An early document which is silent concerning Patrick is the letter of Columbanus to Pope Boniface IV of about 613. Columbanus writes that Ireland's Christianity "was first handed to us by you, the successors of the holy apostles", apparently referring to Palladius only, and ignoring Patrick. Writing on the Easter controversy in 632 or 633, Cummian—it is uncertain whether this is Cumméne Fota, associated with Clonfert, or Cumméne Find—does refer to Patrick, calling him "our papa"; that is, pope or primate. Two works by late seventh-century hagiographers of Patrick have survived. These are the writings of Tírechán and the Vita sancti Patricii of Muirchú moccu Machtheni. Both writers relied upon an earlier work, now lost, the Book of Ultán. This Ultán, probably the same person as Ultan of Ardbraccan, was Tírechán's foster-father. His obituary is given in the Annals of Ulster under the year 657. These works thus date from a century and a half after Patrick's death. Tírechán writes, "I found four names for Patrick written in the book of Ultán, bishop of the tribe of Conchobar: holy Magonus (that is, "famous"); Succetus (that is, the god of war); Patricius (that is, father of the citizens); Cothirtiacus (because he served four houses of druids)." Muirchu records much the same information, adding that "[h]is mother was named Concessa". The name Cothirtiacus, however, is simply the Latinized form of Old Irish Cothraige, which is the Q-Celtic form of Latin Patricius. Legend credits Patrick with teaching the Irish about the doctrine of the Holy Trinity by showing people the shamrock, a three-leafed plant, using it to illustrate the Christian teaching of three persons in one God. This story first appears in writing in 1726, though it may be older. The shamrock has since become a central symbol for Saint Patrick's Day. In pagan Ireland, three was a significant number and the Irish had many triple deities, a fact that may have aided Patrick in his evangelisation efforts when he "held up a shamrock and discoursed on the Christian Trinity". Patricia Monaghan says there is no evidence that the shamrock was sacred to the pagan Irish. However, Jack Santino speculates that it may have represented the regenerative powers of nature, and was recast in a Christian context. Icons of St Patrick often depict the saint "with a cross in one hand and a sprig of shamrocks in the other". Roger Homan writes, "We can perhaps see St Patrick drawing upon the visual concept of the triskele when he uses the shamrock to explain the Trinity". The absence of snakes in Ireland has been noted from as early as the third century by Gaius Julius Solinus, but later legend has attributed the banishment of all reptiles from the island to Patrick. As Roy Flechner shows in his biography, the earliest text to mention an Irish saint banishing snakes from Ireland is in fact the Life of Saint Columba (chapter 3.23), written in the late seventh or early eighth century. The earliest written record of a legend about Patrick ridding Ireland of venomous creatures date to the thirteenth century by Gerald of Wales, who expressed scepticism about the veracity of the story. The more familiar version of the legend is given by Jocelyn of Furness, who says that the snakes had all been banished by Patrick chasing them into the sea after they attacked him during a 40-day fast he was undertaking on top of a hill. The hagiographic theme of banishing snakes may draw on the Biblical account of the staff of the prophet Moses. In Exodus 7:8–7:13, Moses and Aaron use their staffs in their struggle with Pharaoh's sorcerers, the staffs of each side turning into snakes. Aaron's snake-staff prevails by consuming the other snakes. However, all evidence suggests that post-glacial Ireland never had snakes. "At no time has there ever been any suggestion of snakes in Ireland, so [there was] nothing for St. Patrick to banish", says naturalist Nigel Monaghan, keeper of natural history at the National Museum of Ireland in Dublin, who has searched extensively through Irish fossil collections and records. The snakes, rather, were a metaphor for the druids, whom Patrick is said to have driven out of Ireland when he established Christianity there. Some Irish legends involve the Oilliphéist, the Caoránach, and the Copóg Phádraig. During his evangelising journey back to Ireland from his parent's home at (perhaps) Birdoswald, he is understood to have carried with him an ash wood walking stick or staff. He thrust this stick into the ground wherever he was evangelising and at the place now known as Aspatria (ash of Patrick), the message of the dogma took so long to get through to the people there that the stick had taken root by the time he was ready to move on. The version of the details of his life generally accepted by modern scholars,[dubious – discuss] as elaborated by later sources, popular writers and folk piety, typically[improper synthesis?] includes extra details such that Patrick, originally named Maewyn Succat, was born in 387 AD in (among other candidate locations, see above) Banna venta Berniae to the parents Calpernius and Conchessa. At the age of 16 in 403 AD Patrick was captured and enslaved by the Irish and was sent to Ireland to serve as a slave herding and tending sheep in Dalriada. During his time in captivity Patrick became fluent in the Irish language and culture. After six years, Patrick escaped captivity after hearing a voice urging him to travel to a distant port where a ship would be waiting to take him back to Britain. On his way back to Britain, Patrick was captured again and spent 60 days in captivity in Tours, France. During his short captivity within France, Patrick learned about French monasticism. At the end of his second captivity Patrick had a vision of Victoricus giving him the quest of bringing Christianity to Ireland. Following his second captivity Patrick returned to Ireland and, using the knowledge of Irish language and culture that he had gained during his first captivity, brought Christianity and monasticism to Ireland in the form of more than 300 churches and over 100,000 Irish baptised. The Uí Néill and the Airgíalla attempted to bring it to Armagh; the Ulaid tried to keep it for themselves. When the Uí Néill and the Airgíalla came to a certain water, the river swelled against them so that they were not able to cross it. When the flood had subsided the Ui Neill and the Ulaid united on terms of peace, to bring the body of Patrick with them. It appeared to each of them that each had the body conveying it to their respective territories. The body of Patrick was afterwards interred at Dun Da Lethglas with great honour and veneration; and during the twelve nights that the religious seniors were watching the body with psalms and hymns, it was not night in Magh Inis or the neighbouring lands, as they thought, but as if it were the full undarkened light of day. A recent alternative interpretation of Patrick's departure to Ireland suggests that as the son of a decurion he would have been obliged by Roman law to serve on the town council (curia), but chose instead to abscond from the onerous obligations of this office by fleeing abroad, as many others in his position had done in what has become known as the 'flight of the curiales'. However, according to Patrick's own account, it was the raiders who brought him to Ireland where he was enslaved and held captive for six years. Roy Flechner also asserts the improbability of an escape from servitude and journey of the kind that Patrick purports to have undertaken. He also draws attention to the biblical allusions in Patrick's own account (e.g. the theme of freedom after six years of servitude in Exod. 21:2 or Jer. 34:14), which imply that perhaps parts of the account may not have been intended to be understood literally. There are two main types of crosses associated with Patrick, the cross pattée and the Saltire. The cross pattée is the more traditional association, while the association with the saltire dates from 1783 and the Order of St. Patrick. The cross pattée has long been associated with Patrick, for reasons that are uncertain. One possible reason is that bishops' mitres in Ecclesiastical heraldry often appear surmounted by a cross pattée. An example of this can be seen on the old crest of the Brothers of St. Patrick. As Patrick was the founding bishop of the Irish church, the symbol may have become associated with him. Patrick is traditionally portrayed in the vestments of a bishop, and his mitre and garments are often decorated with a cross pattée. The cross pattée retains its link to Patrick to the present day. For example, it appears on the coat of arms of both the Roman Catholic Archdiocese of Armagh and the Church of Ireland Archdiocese of Armagh. This is on account of Patrick being regarded as the first bishop of the Diocese of Armagh. It is also used by Down District Council which has its headquarters in Downpatrick, the reputed burial place of Patrick. Saint Patrick's Saltire is a red saltire on a white field. It is used in the insignia of the Order of Saint Patrick, established in 1783, and after the Acts of Union 1800 it was combined with the Saint George's Cross of England and the Saint Andrew's Cross of Scotland to form the Union Flag of the United Kingdom of Great Britain and Ireland. A saltire was intermittently used as a symbol of Ireland from the seventeenth century, but without reference to Patrick. The National Museum of Ireland in Dublin possesses a bell (Clog Phádraig) first mentioned, according to the Annals of Ulster, in the Book of Cuanu in the year 552. The bell was part of a collection of "relics of Patrick" removed from his tomb sixty years after his death by Colum Cille to be used as relics. The bell is described as "The Bell of the Testament", one of three relics of "precious minna" (extremely valuable items), of which the other two are described as Patrick's goblet and "The Angels Gospel". Colum Cille is described to have been under the direction of an "Angel" for whom he sent the goblet to Down, the bell to Armagh, and kept possession of the Angel's Gospel for himself. The name Angels Gospel is given to the book because it was supposed that Colum Cille received it from the angel's hand. A stir was caused in 1044 when two kings, in some dispute over the bell, went on spates of prisoner taking and cattle theft. The annals make one more apparent reference to the bell when chronicling a death, of 1356: "Solomon Ua Mellain, The Keeper of The Bell of the Testament, protector, rested in Christ." Saint Patrick's Breastplate is a lorica, or hymn, which is attributed to Patrick during his Irish ministry in the 5th century. Patrick features in many stories in the Irish oral tradition and there are many customs connected with his feast day. The folklorist Jenny Butler discusses how these traditions have been given new layers of meaning over time while also becoming tied to Irish identity both in Ireland and abroad. 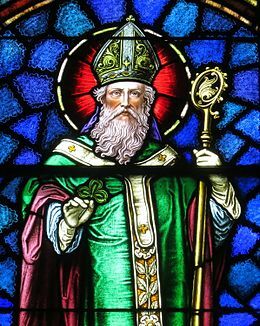 The symbolic resonance of the Saint Patrick figure is complex and multifaceted, stretching from that of Christianity's arrival in Ireland to an identity that encompasses everything Irish. In some portrayals, the saint is symbolically synonymous with the Christian religion itself. There is also evidence of a combination of indigenous religious traditions with that of Christianity, which places St Patrick in the wider framework of cultural hybridity. Popular religious expression has this characteristic feature of merging elements of culture. Later in time, the saint becomes associated specifically with Catholic Ireland and synonymously with Irish national identity. Subsequently, Saint Patrick is a patriotic symbol along with the colour green and the shamrock. Saint Patrick's Day celebrations include many traditions that are known to be relatively recent historically, but have endured through time because of their association either with religious or national identity. They have persisted in such a way that they have become stalwart traditions, viewed as the strongest "Irish traditions". Icon of Saint Patrick from Christ the Savior Orthodox Church, Wayne, WV. St. Patrick's Cathedral in New York City, as seen from Rockefeller Center. 17 March, popularly known as Saint Patrick's Day, is believed to be his death date and is the date celebrated as his Feast Day. The day became a feast day in the Catholic Church due to the influence of the Waterford-born Franciscan scholar Luke Wadding, as a member of the commission for the reform of the Breviary in the early part of the seventeenth century. For most of Christianity's first thousand years, canonisations were done on the diocesan or regional level. Relatively soon after the death of people considered very holy, the local Church affirmed that they could be liturgically celebrated as saints. As a result, Patrick has never been formally canonised by a Pope; nevertheless, various Christian churches declare that he is a Saint in Heaven (he is in the List of Saints). He is still widely venerated in Ireland and elsewhere today. Patrick is honoured with a feast day on the liturgical calendar of the Episcopal Church (USA) and with a commemoration on the calendar of Evangelical Lutheran Worship, both on 17 March. Patrick is also venerated in the Orthodox Church, especially among English-speaking Orthodox Christians living in Ireland, the UK and in the US. There are Orthodox icons dedicated to him. Patrick is said to be buried at Down Cathedral in Downpatrick, County Down, alongside Saint Brigid and Saint Columba, although this has never been proven. Saint Patrick Visitor Centre is a modern exhibition complex located in Downpatrick and is a permanent interpretative exhibition centre featuring interactive displays on the life and story of Patrick. It provides the only permanent exhibition centre in the world devoted to Patrick. Slemish, County Antrim, traditionally associated with Saint Patrick's time as a shepherd slave. It is claimed that Patrick founded his first church in a barn at Saul, which was donated to him by a local chieftain called Dichu. It is also claimed that Patrick died at Saul or was brought there between his death and burial. Nearby, on the crest of Slieve Patrick, is a huge statue of Patrick with bronze panels showing scenes from his life. Patrickswell Lane, a well in Drogheda Town where St. Patrick opened a monastery and baptised the townspeople. Parroquia San Patricio y Espiritu Santo. Loiza, Puerto Rico. The site was initially mentioned in 1645 as a chapel. The actual building was completed by 1729, is one of the oldest churches in the Americas and today represents the faith of many Irish immigrants that settled in Loiza by the end of the 18th century. Today it is a museum. Robert Southey wrote a ballad called "Saint Patrick's Purgatory", based on popular legends surrounding the saint's name. Stephen R. Lawhead wrote the fictional Patrick: Son of Ireland loosely based on the saint's life, including imagined accounts of training as a druid and service in the Roman army before his conversion. The 1999 historical novel Let Me Die in Ireland by Anabaptist author and attorney David Bercot is based on the documented facts of Patrick's life rather than the legend, and suggests implications of his example for Christians today. St. Patrick: The Irish Legend is a 2000 television historical drama film about the saint's life. Patrick is portrayed by Patrick Bergin. ^ Meekins, Jeannie. Saint Patrick. Learning Island. p. 14. ^ "Saint Patrick Retold: The Legend and History of Ireland's Patron Saint". Princeton University Press. 2019. ^ a b Hennessy, W. M. (trans.) Annals of Ulster; otherwise, Annals of Senat, Vol. I. Alexander Thom & Co. (Dublin), 1887. ^ Thompson, E.A. (1999). Who Was Saint Patrick?. The Boydell Press. pp. 166–75. ^ Roy Flechner (2019). Saint Patrick Retold: The Legend and History of Ireland's Patron Saint. Princeton University Press. ISBN 978-0691190013. ^ The Catholic Encyclopedia states he was born in Kilpatrick, Scotland. Herbermann, Charles, ed. (1913). "St. Patrick". Catholic Encyclopedia. New York: Robert Appleton Company. ^ MacNeill, Eoin (1926). "The Native Place of St. Patrick". Proceedings of the Royal Irish Academy. Dublin: Hodges, Figgis: 118–40. Retrieved 17 March 2013. MacNeill argues for an origin in South Wales, noting that the western coasts of southern Scotland and northern England held little to interest a raider seeking quick access to booty and numerous slaves, while the southern coast of Wales offered both. In addition, the region was home to Uí Liatháin and possibly also yDéisi settlers during this time, so Irish raiders would have had the contacts to tell them precisely where to go to quickly obtain booty and capture slaves. MacNeill also suggests a possible home town based on naming similarities, but allows that the transcription errors in manuscripts make this little more than an educated guess. ^ "An Inquiry as to the Birthplace of St. Patrick. By J.H. Turner, M.A. p. 268. Read before the Society, 8 January 1872. Archaeologia Scotica pp. 261–84. Society of Antiquaries of Scotland, Volume 5, 1890". Retrieved 17 March 2019. ^ a b c d "Confession of St Patrick". Christian Classics Ethereal Library. 2013-04-07. ^ "Confession of St. Patrick, Part 17". Christian Classics Ethereal Library. Retrieved 11 March 2010. ^ "Confession #19". St Patrick's Confessio. Royal Irish Academy. ^ Thomas, Charles (1981). Christianity in Roman Britain to AD 500. University of California Press. p. 51. ISBN 978-0520043923. ^ Bridgwater, William; Kurtz, Seymour, eds. (1963). "Saint Patrick". The Columbia Encyclopedia (3rd ed.). New York: Columbia University Press. pp. 1611–12. ^ a b One or more of the preceding sentences incorporates text from a publication now in the public domain: Herbermann, Charles, ed. (1913). "St. Patrick" . Catholic Encyclopedia. New York: Robert Appleton. ^ "Confession of St. Patrick, Part 50". Christian Classics Ethereal Library. Retrieved 11 March 2010. ^ This is presumed to refer to Patrick's tonsure. ^ "Letter To Coroticus, by Saint St. Patrick". Gilder Lehrman Center at Yale University. Archived from the original on 22 March 2010. Retrieved 11 March 2010. ^ Todd, James (1864). "The Epistle on Coroticus". St. Patrick: Apostle of Ireland: a Memoir of His Life and Mission, with an Introductory Dissertation on Some Early Usages of the Church in Ireland, and Its Historical Position from the Establishment of the English Colony to the Present Day. Dublin: Hodges, Smith, & Co. pp. 383–85. ^ De Paor 1993, pp. 141–43; Charles-Edwards 2000, pp. 182–83 Bede, writing a century later, refers to Palladius only. ^ Their works are found in De Paor, pp. 154–74 & 175–97 respectively. ^ Ó Cróinín 1995, pp. 30–33. Ramsay MacMullen's Christianizing the Roman Empire (Yale University Press, 1984) examines the better-recorded mechanics of conversion in the Empire, and forms the basis of Ó Cróinín's conclusions. ^ De Paor's conclusions at p. 135, the document itself is given at pp. 135–38. ^ a b Monaghan, Patricia (2009). The Encyclopedia of Celtic Mythology and Folklore. Infobase Publishing. ISBN 978-1438110370. ^ Hegarty, Neil (2012). Story of Ireland. Ebury Publishing. ISBN 978-1448140398. ^ Santino, Jack (1995). All Around the Year: Holidays and Celebrations in American Life. University of Illinois Press. p. 80. ISBN 978-0252065163. ^ Roy Flechner (2019). Saint Patrick Retold: The Legend and History of Ireland's Patron Saint. Princeton University Press. p. 213. ISBN 978-0-691-19001-3. ^ Saint Patrick Retold: The Legend and History of Ireland's Patron Saint. Princeton University Press. 2019. p. 211. ISBN 978-0691190013. ^ Robinson, William Erigena. New Haven Hibernian Provident Society. St. Patrick and the Irish: an oration, before the Hibernian Provident Society, of New Haven, 17 March 1842. p. 8. ^ a b c Owen, James (March 13, 2008). "Snakeless in Ireland: Blame Ice Age, Not St. Patrick". National Geographic News. Retrieved 17 March 2011. ^ von Fleischer, Aylmer (2015). Megalith: The Black Builders of Stonehenge. Aylmer von Fleischer. p. 75. Metaphorically the sankes [sic] were the Black Druids. St. Patrick's Christian religion superseded the serpent-worship of the Back Druids, hence the snakes were drive out of Ireland. ^ Nagy, Joseph Falaky (2006). "Acallam na Senórach". In Koch, John T. Celtic Culture: A Historical Encyclopedia. 1. Oxford: ABC-CLIO. p. 8. ISBN 978-1-85109-440-0. ^ "Saint Patrick Biography". The Biography Channel Website. ^ Annals of the Four Masters, ed. & tr. John O'Donovan (1856). Annála Rioghachta Éireann. Annals of the Kingdom of Ireland by the Four Masters... with a Translation and Copious Notes. 7 vols (2nd ed.). Dublin: Royal Irish Academy. s.a. 493.3 CELT editions. Full scans at Internet Archive: Vol. 1; Vol. 2; Vol. 3; Vol. 4; Vol. 5; Vol. 6; Indices. ^ Was St Patrick a slave-trading Roman official who fled to Ireland? March 17, 2012 Dr Roy Flechner Cambridge Research News. Accessed 9 March 2016. This article was published in Tome: Studies in Medieval History and Law in Honour of Thomas Charles-Edwards, ed. F. Edmonds and P. Russell (Woodbridge: Boydell, 2011). ^ "Heraldic Dictionary – Crowns, Helmets, Chaplets & Chapeaux". Rarebooks.nd.edu. 2003-02-24. Retrieved 2018-07-16. ^ "An Archbishop's Mitre | ClipArt ETC". Etc.usf.edu. Retrieved 2018-07-16. ^ "Happy Saint Patrick's Day!". Catholicism.about.com. Retrieved 2018-07-16. ^ "St. Patrick". Catholicharboroffaithandmorals.com. Retrieved 2018-07-16. ^ "Optional Memorial of St. Patrick, bishop and confessor (Solemnity Aus, Ire, Feast New Zeal, Scot, Wales) – March 17, 2012 – Liturgical Calendar – Catholic Culture". Catholicculture.org. Retrieved 2018-07-16. ^ "Archdiocese of Armagh". Armagharchdiocese.org. 2018-05-31. Retrieved 2018-07-16. ^ "The Church of Ireland Diocese of Armagh | For information about the Church of Ireland Diocese of Armagh". Armagh.anglican.org. Retrieved 2018-07-16. ^ Colgan, Nathaniel (1896). "The Shamrock in Literature: a critical chronology". Journal of the Royal Society of Antiquaries of Ireland. Royal Society of Antiquaries of Ireland. 26: 349. ^ a b Croker, Thomas Crofton (1839). The Popular Songs of Ireland. Collected and Edited, with Introductions and Notes. Henry Colburn. pp. 7–9. Retrieved 10 March 2019. ^ "Irishman's Diary: The Patrick's Cross". The Irish Times. 13 March 1935. p. 4 – via ProQuest. ^ "Clog Phádraig agus a Chumhdach [The Bell of St. Patrick and its Shrine]". Dublin: NMI. 2015. Retrieved 26 November 2015. ^ The bell was formerly known as "The Bell of St Patrick's Will" (Clog an eadhachta Phatraic), in reference to a medieval forgery which purported to have been the saint's last will and testament. ^ Gregory Cleary (1913). "Luke Wadding" . In Herbermann, Charles. Catholic Encyclopedia. New York: Robert Appleton Company. ^ "St Patrick the Bishop of Armagh and Enlightener of Ireland". oca.org. Retrieved 11 November 2007. ^ "Icon of St. Patrick". www.orthodoxengland.org.uk. Retrieved 17 March 2008. ^ "Placenames NI – The Northern Ireland Place-Name Project". Placenamesni.org. Archived from the original on 17 March 2012. Retrieved 19 October 2012. ^ "Cruach Phádraig, Bunachar Logainmneacha na hÉireann – Placenames Database of Ireland". logainm.ie. Government of Ireland. 13 December 2010. Retrieved 19 October 2012. ^ "Loch Dearg, Bunachar Logainmneacha na hÉireann – Placenames Database of Ireland". logainm.ie. Government of Ireland. 13 December 2010. Retrieved 19 October 2012. ^ "Old Patrick Water, linear feature". Saints in Scottish Place-names. Commemorations of Saints in Scottish Place-names. ^ "Tobar Phádraig, Bunachar Logainmneacha na hÉireann – Placenames Database of Ireland". logainm.ie. Government of Ireland. 13 December 2010. Retrieved 19 October 2012. ^ "Teampall Phádraig, Bunachar Logainmneacha na hÉireann – Placenames Database of Ireland". logainm.ie. Government of Ireland. 13 December 2010. Retrieved 19 October 2012. ^ "Introduction". Saint Patrick's Cross Liverpool. Retrieved 19 October 2012. ^ "Patrick: Son of Ireland | Books". StephenLawhead.com. 23 August 2007. Archived from the original on 28 May 2009. Retrieved 4 October 2009. ^ Bercot, David W. (1999). Let Me Die in Ireland: The True Story of Patrick. Tyler, TX: Scroll Pub. ISBN 978-0924722080. OCLC 43552984. Bury, John Bagnell (1905). Life of St. Patrick and His Place in History. London: Macmillan. Byrne, Francis J. (1973). Irish Kings and High-Kings. London: Batsford. ISBN 978-0-7134-5882-4. Charles-Edwards, T.M. (2000). Early Christian Ireland. Cambridge: Cambridge University Press. ISBN 978-0-521-36395-2. Dark, Ken (2000). Britain and the End of the Roman Empire. Stroud: Tempus. ISBN 978-0-7524-2532-0. De Paor, Liam (1993). Saint Patrick's World: The Christian Culture of Ireland's Apostolic Age. Dublin: Four Courts Press. ISBN 978-1-85182-144-0. Duffy, Seán, ed. (1997). Atlas of Irish History. Dublin: Gill and Macmillan. ISBN 978-0-7171-3093-1. Dumville, David M. (1993). Saint Patrick, AD 493–1993. Woodbridge: The Boydell Press. ISBN 978-0-85115-332-2. Flechner, Roy (2011). "Patrick's Reasons for Leaving Britain". In Russell, Edmonds. Tome: Studies in Medieval Celtic History and Law in Honour of Thomas Charles-Edwards. Woodbridge: Boydell Press. ISBN 978-1-84383-661-2. Flechner, Roy (2019). Saint Patrick Retold: The Legend and History of Ireland's Patron Saint. Princeton, NJ: Princeton University Press. ISBN 978-0691184647. Fletcher, Richard (1997). The Conversion of Europe: From Paganism to Christianity 371–1386 AD. London: Harper Collins. ISBN 978-0-00-686302-1. Hood, A.B.E. (1978). St. Patrick: his Writings, and Muirchú's Life. London and Chichester: Phillimore. ISBN 978-0-85033-299-5. Ó Cróinín, Dáibhí (1995). Early Medieval Ireland: 400–1200. London: Longman. ISBN 978-0-582-01565-4. O'Rahilly, T. F. (1942). The Two Patricks: A Lecture on the History of Christianity in Fifth-Century Ireland. Dublin: Dublin Institute for Advanced Studies. Stancliffe, Claire (2004). "Patrick (fl. 5th cent.)". Oxford Dictionary of National Biography. Oxford University Press. doi:10.1093/ref:odnb/21562. Retrieved 17 February 2007. Thomas, Charles (1981). Christianity in Roman Britain to AD 500. London: Batsford. ISBN 978-0-7134-1442-4. Thompson, E.A. (1980). Caird, G.B. ; Chadwick, Henry, eds. "St. Patrick and Coroticus". The Journal of Theological Studies. 31: 12–27. doi:10.1093/jts/XXXI.1.12. White, Newport J.D. (1920). St. Patrick, His Writings and Life. New York: Macmillan. Retrieved 17 March 2013. Wood, Ian (2001). The Missionary Life: Saints and the Evangelisation of Europe 400–1050. London: Longman. ISBN 978-0-582-31213-5. Yorke, Barbara (2006). The Conversion of Britain: Religion, Politics and Society in Britain c. 600–800. London: Longman. ISBN 978-0-582-77292-2. Brown, Peter (2003). The Rise of Western Christendom: Triumph and Diversity, A.D. 200–1000 (2nd ed.). Oxford: Blackwell. ISBN 978-0-631-22138-8. Cahill, Thomas (1995). How the Irish Saved Civilization. New York: Doubleday. ISBN 978-0-385-41849-2. Dumville, David (1994). "The Death Date of St. Patrick". In Howlett, David. The Book of Letters of Saint Patrick the Bishop. Dublin: Four Courts Press. ISBN 978-1-85182-136-5. Healy, John (1892). "The Arrival of Saint Patrick" . The Ancient Irish Church (1 ed.). London: Religious Tract Society. pp. 17–25. Hughes, Kathleen (1972). Early Christian Ireland: Introduction to the Sources. London: Hodder & Stoughton. ISBN 978-0-340-16145-6. Iannello, Fausto (2008). "Note storiche sull'Epistola ad Milites Corotici di San Patrizio". Atti della Accademia Peloritana dei Pericolanti, Classe di Lettere, Filosofia e Belle Arti. 84: 275–285. Moran, Patrick Francis Cardinal (1913). "St. Patrick" . In Herbermann, Charles. Catholic Encyclopedia. New York: Robert Appleton Company. McCaffrey, Carmel (2003). In Search of Ancient Ireland. Chicago: Ivan R Dee. ISBN 978-1-56663-525-7. MacQuarrie, Alan (1997). The Saints of Scotland: Essays in Scottish Church History AD 450–1093. Edinburgh: John Donald. ISBN 978-0-85976-446-9. O'Loughlin, Thomas (1999). "Saint Patrick: The Man and his Works". London: S.P.C.K. O'Loughlin, Thomas (2000). "Celtic Theology". London: Continuum. O'Loughlin, Thomas (2005). "Discovering Saint Patrick". New York: Orbis. O'Loughlin, Thomas (2005). "The Capitula of Muirchu's Vita Patricii: do they point to an underlying structure in the text?". Analecta Bollandiana. 123: 79–89. doi:10.1484/J.ABOL.4.00190. O'Loughlin, Thomas (2007). Nagy, J. F., ed. The Myth of Insularity and Nationality in Ireland. Dublin: Four Courts Press. pp. 132–140. Saint Patrick's Confessio Hypertext Stack as published by the Royal Irish Academy Dictionary of Medieval Latin from Celtic Sources (DMLCS) freely providing digital scholarly editions of Saint Patrick's writings as well as translations and digital facsimiles of all extant manuscript copies. Saint Patrick Retold by Roy Flechner; a biography from Princeton University Press. This page was last edited on 20 April 2019, at 02:30 (UTC).